Natural cheeses, such as mozzarella, Swiss and cheddar and processed cheeses, such as American slices, are convenient choices for sandwiches, snacks and party platters. Cheese provides essential nutrients. It's healthiest when consumed as part of an overall balanced meal plan. Sliced cheese provides quality protein, which is an essential and filling nutrient. It has some natural sugars from the lactose in milk, and it may fit into a low-carbohydrate diet. Some kinds of sliced cheese are high in potassium, which helps regulate blood pressure, and low in cholesterol. Eat three daily servings of reduced-fat dairy products, such as cheese, to meet recommendations in the U.S. Department of Agriculture's Dietary Guidelines. Choose low-fat or fat-free sliced cheese to limit your intake of saturated fat. Cheese is among the top sources of saturated fat in the diet of the average American, according to the Department of Agriculture's Dietary Guidelines. Saturated fat raises levels of bad LDL cholesterol in your blood, and it may increase your risk of heart disease. Sliced part-skim mozzarella, low-fat cheddar and nonfat processed American cheese are all good choices. Aged sliced cheeses are healthy, because they are naturally high in calcium. A 1 1/2-oz. 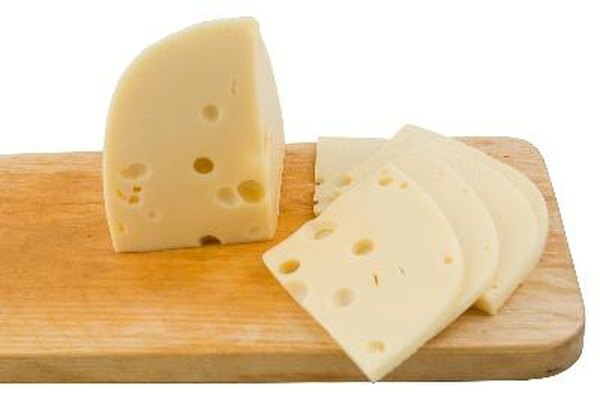 serving of Swiss, provolone, muenster or mozzarella has 300 mg calcium, or more than 30 percent of your daily value. Processed Swiss and American cheese have similar amounts. Calcium is an essential nutrient for building and maintaining strong bones, and a deficiency increases your risk of fractures. Sliced cheese helps you meet your recommendations for dairy products, but the Palo Alto Medical Foundation suggests limiting your intake of cheese because it is high in sodium. If you do not eat dairy products because you are lactose-intolerant or you are following a vegan diet, you can get many of the benefits of healthy sliced cheese by eating soy cheese. This dairy substitute provides calcium and quality protein.